So how many referees does it take to run a sanctioned tournament or any pickleball tournament for that matter? The answer is 1. If you have 300 matches to play during your tournament, and your one referee agrees to do all of them, then he or she will be one tired referee. But in theory you could do it. But the real answer is, it depends on the number of courts you have available for your tournament. If you have 6 courts, then you minimally need 6 referees who are willing to referee all the matches that occur on their court that day. If you have 8 courts, then you need a minimum of 8 referees. If you have 12 courts, 12 refs and so on. That is, of course, the minimum number needed to have a referee on every match and thus pass that sanctioning requirement. Now, do we think that is a realistic number? Of course not. If you have six courts and can find people willing to referee a half day, then you can get by with 12 people. 8 courts would need 16 refs and so on. But the bottom line is, you need a referee on each court all day long. So how do you do that? Well, it still goes back to the number of courts you have. It is important that you have enough referees lined up and one assigned to each court at the beginning of each day. That allows you to get off to a good start. The keyword here was “assigned” ahead of time. So referees are already on their courts and ready to go when the players arrived courtside to warm up for that first match. Don’t wait until 15 minutes before the start of your tournament to see who shows up to ref and then assign them. Schedule and assign them at the beginning of each day. Likewise it is crucial to schedule your referees for the end of each day. Again, you will need as many refs as you will have courts running in that final two to three hours of the day. This allows you to end each day on a good note. So where do you get your referees for the rest of each day? That is where your players will always help fill in. When players register for a tournament, you should always ask, during registration, if they would be willing to help out with a little refereeing. Many will signup when offered the option during registration. Now the key, very important part: Contact those volunteer players two weeks in advance and ask them to signup for a shift to referee. Let them pick what day and time they want to offer their services. Then follow up with them to confirm you have them scheduled for that day and time. This allows the players to choose the day and time that is most convenient for them and also is the most likely to cause them to follow through on their commitment. Make a spreadsheet with days and timeslots available and fill it in as people and players commit. Then it is easy to see the times where you will need some additional help. But knowing that challenge days ahead of time, rather than the day of the tournament, makes it easy to address. You will be pleasantly surprised how easy it is to get the necessary referees to allow your tournament to be a USAPA sanctioned event. It takes some planning, but it is well worth having that USAPA seal of approval on your tournament. It shows your commitment to growing the tournament side of the sport the right way and is always appreciated by the players who play it. 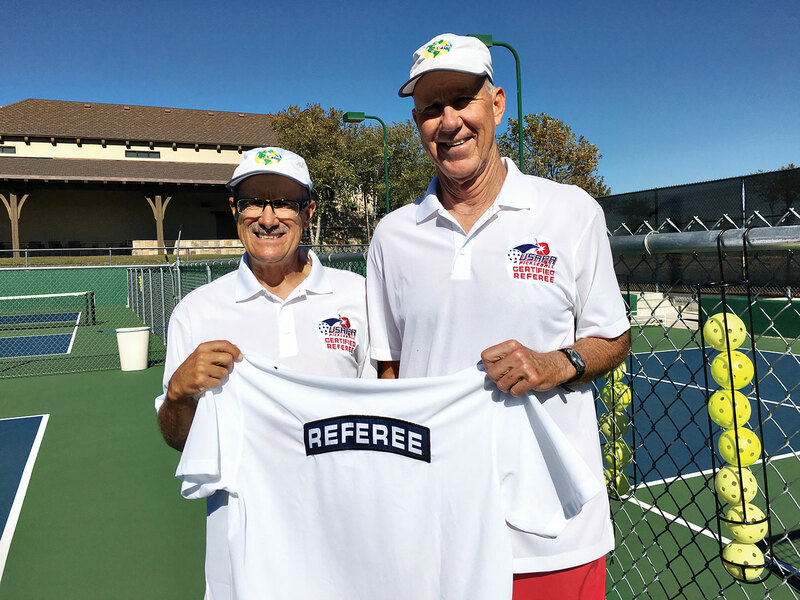 Having a pickleball tournament without a referee is no different than having a basketball game without a ref or a baseball game without an umpire or any other sport without any officials. It simply becomes no different than playing for fun at your local courts. The gold standard when it comes to very well run sanctioned tournaments is of course the USAPA National tournament in Casa Grande. The 2016 Nationals had over 2,000 matches played on 32 courts and every single match was refereed by only 157 people. It’s really not as tough as people make it out to be. I love it when I walk onto the court at a tournament and there is a referee standing there. It doesn’t have to be a USAPA certified ref. It simply needs to be someone who can keep score for us and watch the kitchen violations. When I see that referee on my court, I know someone is working hard behind the scenes to give me a good tournament playing feel. Thank you to those tournament directors that go that extra mile. It certainly is noticed and appreciated. Pickleball Rocks because of you. Join us at the pavilion next to the food trailer Thursday November 9th from 4:00-6:00 for a party just for USAPA junior Players, featuring free pizza, pop and Sick Trx. SickTrx is not your grandma’s pickleball. 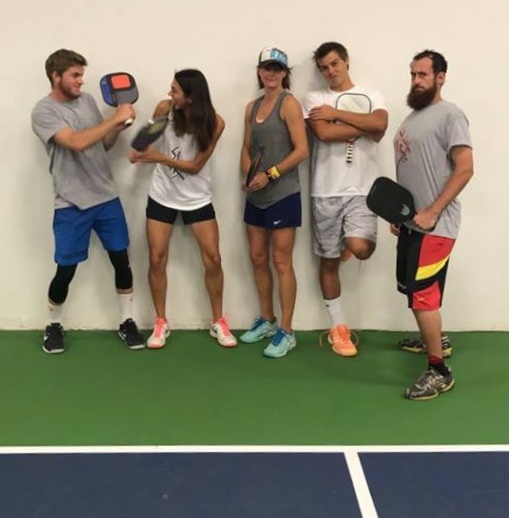 The Sick Trx guys and gals are a combination of national champions and top rated professional pickleball players who are inspiring a new generation of pickleball players around the world through their entertaining exhibitions and clinics. Sick Trx members who have committed to come to the party includes: Brian “The Beard” Ashworth, Irena Tereshenko, Ben Johns, Kyle Yates and Vicki Love. Sick Trx will be doing a little bit of teaching and having a whole lot of fun on court with you. Bring your paddles.